Tony Abbott is fulminating about those dastardly eco-warriors and their sabotage of Adani’s plan to build the world’s biggest coal mine in Queensland’s Galilee Basin. It was “dangerous for our country and it’s tragic for the wider world,” lamented the Prime Minister to journalists in Tasmania on Friday morning. It is too much to expect that the government will suddenly drop its ideological war against renewable energy in favour of hard risk analysis and common sense. The fracas began on Wednesday when the Federal Court ruled in favour of a challenge to Adani’s Carmichael mine by the Mackay Conservation Group. Two little-known species, the furtive yakka skink and ornamental snake were the culprits. The snake and the skink had not been given due consideration by government in its environmental approvals process. This was more of a setback to Adani than a sweeping defeat. That evening, however, Fairfax Media broke the story that the Commonwealth Bank of Australia (CBA) was no longer Adani’s financial adviser. This news was devastating for the Indian power group. As the nation’s biggest bank and pre-eminent financier of large resources projects, a CBA break-up with Adani suggested the obvious; the project simply didn’t stack up. The bank confirmed its withdrawal in a manicured one-line statement to Fairfax Media. Was this a case of teenage break-up syndrome? I broke up with her before she broke up with me? Whatever the machinations, if the CBA wanted to be there, it would be. A retinue of global banks have already turned Adani down; it is yet to find a friend. And this is just as much about economics as the environment. The coal price would have to double for the Carmichael Mine to be viable. On Thursday, the share price of Adani contractor Downer EDI was thumped 10 per cent on the sharemarket though it had yet to sign a contract. Meanwhile, they were ducking for cover in Canberra. Opposition Leader Bill Shorten had confirmed Labor’s support for the project on radio. The PM’s office though was silent, preferring to herald its response the next day via a front page story in The Australian headlined, “End green sabotage of coal: PM”. The backlash against the eco-warriors had begun in earnest. How dare those conservationists do what corporations do, use the court system. Again, the tactic of fomenting community anger over supposedly job-hating greenies misses the point – that there is nothing to be gained by putting the environment at risk, dredging the Barrier Reef, for a coal project that has such a slim chance of ever making a dollar. A few issues with this. One, Adani Mining’s own chief executive has recently been low-balling Carmichael as a $US4 billion investment (not $21 billion) while more independent voices put it at $16.5 billion total (not $21 billion), of which Adani has already spent $1.3 billion (not $3 billion as that must include the T1 port at Abbot Point, which is a separate, operating, non-stranded asset, costs sunk). Two, Jerome Fahrer, Adani’s own expert in a court challenge in April, conceded 1464 jobs would be created (not 10,000). And three, the “save the 100 million poor people of India” rhetoric is a bit rich in light of India’s own energy minister being on record saying thermal coal imports should cease by 2021. It is likely to be earlier than that. The importance of demand cannot be underestimated. It emerged that India’s coal imports dropped 11 per cent in July year-on-year, having grown at 25 to 30 per cent for the past five years. Unlike Australia, India also has the distinction of having an energy policy. Not only are they planning to end coal imports but, with considerable will and vision, radically ramping up renewable energy distribution (target 175GW by 2022). In contrast, Australia proceeds, higgledy-piggiledy, with its de facto policy: “dig stuff up and let multinationals transfer price it through Singapore”. Despite paying lip service to renewables, Labor has yet to show the intestinal fortitude to challenge Adani’s ebullient projections either. Shorten was fence-sitting with his usual flair on Friday. Should this coal mine proceed? he was asked at a presser. “That will depend” etc. Both parties back this thing despite Adani’s own modelling suggesting it needs the price of thermal coal to double and claims that it will be twice as cost-efficient as the existing coal giants such as Rio and BHP. 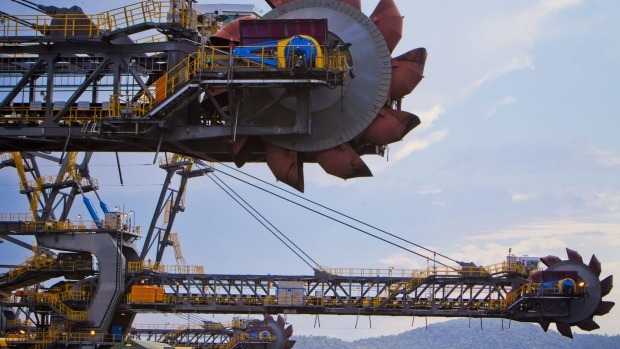 If Shorten is at all fair dinkum about a 50 per cent renewable energy target, he can ill-afford to back a project the size of this, which is uneconomic and will flood the market with surplus coal. All the signs are that coal is in structural, rather than cyclical, decline. It will be around for some time yet but the risk that renewables storage technology may soon supersede fossil fuels as not just a cleaner, but a cheaper, source of energy can no longer be ignored. The banks have begun to recognise this and are now evaluating their exposures. Apart from increasing investment by global players such as Citi, National Australia Bank was the first to model coal risk and it seems CBA is hard on its heels – at some risk to itself. Word is, and this is unconfirmed but entirely plausible, the government has been dropping weights on CBA to fund Carmichael. Even if this is not the case, it is a precarious act for a bank to spurn the pressure of financing projects already championed in Canberra. The returns on privatisation mandates and such corporate deals are high. The banks know they need to keep the government onside. So it was that CBA’s statement about its split with Adani is so delicately worded. Former NAB chief Cameron Clyne is one banker on record criticising Australia’s energy policy and he has won no friends in business or government doing so. Most executives are happy to tow the line, a line inimical to new energy and adhering to the flat-earthers’ maxim “coal is the future”. Bank exposure to fossil fuels projects runs into the hundreds of billions of dollars. There are large rehabilitation costs involved, mostly unfunded. Should these assets become “stranded”, the banks are stuck with them if they cannot be sold. The Isaac Plains coal mine in Queensland was sold for just $1 last month after 50 per cent of it exchanged hands for $450 million just four years ago – making more than a 99.9 per cent reduction in value. It is too much to expect that the government will suddenly drop its ideological war against renewable energy in favour of hard risk analysis and common sense, or for the opposition – fearing the spectre of being wedged as anti-jobs – to display enough backbone to do the same. So the fate of Carmichael may hang in the balance for some time, as the war between new and old energy plays out.